The Massachusetts women’s track and field swept through the Reggie Lewis Center in Roxbury, MA on Friday, taking first place at the Joe Donahue Indoor Games. UMass scored 259 points, beating out Northeastern, and avenging last week’s result at the Beantown Challenge. Also taking firsts on the track were sophomore Jada Harris in the 60 hurdles (8.84 seconds), Witt in the 400m (58.55), and freshman Bryanna Rivers in the 800m (2:16.5). UMass’ streak of success in the field events continued into this weekend’s meet. Junior Charlotte Robison took the win in the long jump at 18 feet, 1.75 inches, and freshman Ivana Nyemeck took the triple jump at 38 feet, 1.25 inches. This was complemented by seconds from Karyla Rorke in the pole vault and Danielle Notarfrancesco in the shot put, as well as thirds from Ashley Arroyo in the triple jump and Lauren LaDere in the shot put. In distance events, the Minutewomen were led by seconds from Colleen Sands in the mile (5:03) and Brooke Hansel in the 3000m (10:27). Caroline Clark finished just behind Sands in the mile at 5:08, while Alexa Livingstone (10:29) and Catherine Curtin (10:32) closely followed Hansel in the 3000m. 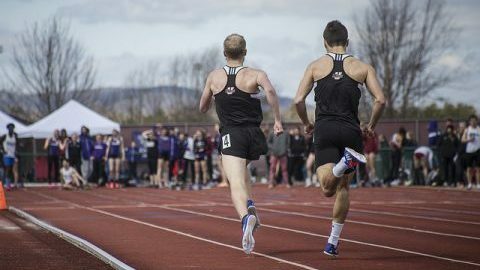 On the men’s side, UMass placed fourth with 106.5 points against a field that included both Harvard and Northeastern. They were led by junior Brian Gendron’s first place in the 800 (1:54.41), the lone first place on the day. Zabih Kotecha was fourth in that event in 2:00.15. The Minutemen placed several other athletes in top spots, including seconds from senior Russell Wells in the 1000m (2:31.27) and sophomore Jackson Southard in the 3000m (8:43.03). UMass’ pair of sophomores in the mile, Mike McDonald and Dawson Bathgate, placed second and third, both logging times of 4:19. Jake DeGrace also continued his success in the 60 hurdles, taking second in 8.12. In the field events, juniors Cole Acoveno and Benjamin Murphy took second and fourth in the high jump, with both clearing 6 feet, 2 inches. Senior John Chuma took fourth in the pole vault at 15 feet, 3 inches, followed by sophomore Mason Lord at 14 feet, 9 inches. UMass will be back next Saturday for the John Thomas Terrier Classic at Boston University on January 27th. That will be their final event before the postseason begins at the New England Championships on February 2nd. Will Katcher can be reached at [email protected] and followed on Twitter at @will_katcher.